WILD SPOILERS AHEAD: Last week’s episode, Vatos, was dominated by intense action. Wildfire simmers with equal conflict and urgency, but in a muted tone. The story is more rooted in character, and as a result, the score focuses on orchestral elements more than other episodes. The opening act, where Andrea must say goodbye to her sister Amy, uses orchestral colors almost exclusively. Rick, Shane and the rest of the group watch nervously as Amy awakens from death in Andrea’s arms. The scene radiates a surprising gentleness. The motive is performed by a clarinet and a solo French horn, marking the first time a brass instrument has been included in the score. The horn soloist is Laura Brenes, whose heroic sound soared throughout the “Human Target” soundtrack. Zombie Amy sputters to life and reaches for her sister, while Rick and Shane ready their guns. The scene is very tense. However, layering it with suspenseful, horror clusters would have ironically lessened the tension. The emotional connection here is between the sisters. Andrea is less concerned with her own survival and more concerned about being able to communicate her final words to Amy she never got to say. With the score, I wanted to make their storyline the primary focus, and ignore the zombie elements in the scene. The tension is already there, in the actors’ performances and the subtext. So, no evil banjo in this scene. My goal was to imply that Jim is transforming from himself into a zombie. Did you guys pick up on this? Whether or not you noticed the “zombie banjo” reference, the cues still created an appropriately nightmarish texture. The dulcimers are generally a background element behind the more prominent electric banjo and percussive autoharps. This cue is the first time I’ve featured the dulcimers as a solo instrument. The result is a creepy sound that also suggests we’re arriving at a place both geographically and narratively we’ve never been yet. 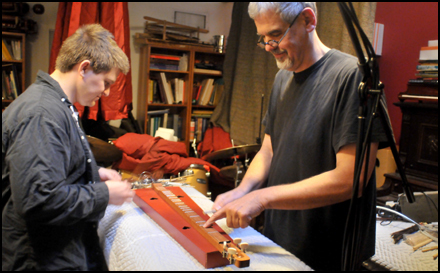 The ambient dulcimers blended seamlessly into the buzzing flies in the sound design to create a unique soundscape. Like Amy’s resurrection scene, I wanted to focus on the character conflict and drama rather than the superficial suspense of impending zombie mayhem. The result helps make the scene a dramatic one as well as a suspenseful one. At last, the doors open wide, setting up the story for next week’s episode: the conclusion of the first season of “The Walking Dead.” Keep an eye out here in the next week or two. I will blog about the final episode of season one, as well as several fun holiday-related projects.